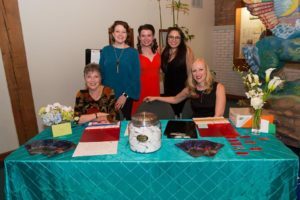 Dedicated volunteers greeted guests at the 2017 State of Mind event. Janelle Lutz is the featured entertainer at Second Thought Theatre’s (STT) fifth annual State of Mind. She will perform a cabaret of vocals from musical theater, Disney and a variety of well-known tunes. The evening gives the theater an opportunity to thank its generous and dedicated supporters before kicking off the new season of compelling theatre. It offers a state-of-the-union type of progress report and announces new initiatives and plans. It is STT’s enjoyable, entertaining evening that celebrates its sponsors and patrons each year. The talented triple-threat is also an accomplished voice-over talent. Lutz said, “I’m so glad to be invited to perform at State-of-Mind and to offer my support.” Although she has not yet performed at STT, she looks forward to that opportunity. “We are thrilled to have Lutz, a Dallas musical theater favorite, joining us for the festivities,” added co-chair Jim Nugent. “Janelle is a phenomenally talented performer. Her performance will be a perfect complement to this celebration in support of STT’s own storytelling. “Each year, with the generous support of our patrons and subscribers, State of Mind raises a significant portion of the funds necessary to create the innovative and stimulating theatre with which STT has become synonymous, and we are so grateful for the growth this has afforded us.” Wade Owens, STT’s State of Mind 2018 event co-chair, said. State of Mind will begin with cocktails and festive fare at 7 p.m., followed by Lutz, accompanied by accomplished pianist Adam C. Wright. Rob McCollum will emcee and Dallas-based director and choreographer Joel Ferrell, whose STT’s directorial credits include “The Necessities,” “Othello” and “Gruesome Playground Injuries,” will be the featured guest. The event will also include a Fund the Mission auction, the proceeds of which will provide financial support for STT’s 2019 season. Cocktails and mingling with STT artists and supporters will finish the evening. State of Mind is at the Sammons Center for the Arts, 3630 Harry Hines Blvd. in Dallas. For additional information, visit secondthoughttheatre.com.